The Papua New Guinea Games Organizing Committee has opened a Universal Airlines Travel Plan (UAPT) account with Air Niugini recently to get air travel plans going for the committee in preparation for the games in November this year. 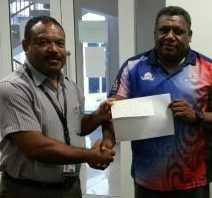 PNG Games Director, Sports John Susuve in opening the UATP account, presented a cheque of K50,000 as initial payment to Air Niugini to kick start any travel plans they may have. He said this money will go towards covering the committee’s travel to the host province to ensure games readiness including the venues. “We are getting the ball rolling on games readiness and this cheque will ensure the committee travels to the games venues to ensure, all is set for the games. Also with the money now in UATP account, we can negotiate with Air Niugini for discounted airfares or take advantage of their special fares.” Susuve said. Air Niugini’s National Corporate Sales Manager, Mr Charlie Wanma who received the cheque on behalf of Air Niugini said as the official carrier of the Pacific Games, Air Niugini will do everything possible to bring athletes all over the country to Kimbe for the games. Since November and December are busy travel period, the teams who are participating in the PNG Games are encouraged to plan early. The PNG Games for this year will be held in Kimbe, West New Britain. Athletes from 22 provinces will converge for the games and take part in 24 sports including para sports. PNG Games provides an opportunity for selectors to identify raw sporting talents and give athletes the opportunity to further develop and enhance those skills in the hope of one day representing Papua New Guinea at an international level. Some PNG athletes who are now competing at the international level were identified through PNG Games.